Easily hole-punch documents you need to keep in your planner. Has a spill-proof chip collector and a nonslip base. Also features marked paper guides. Seven holes; for Classic Style, 5 1/2" x 8 1/2" page size. 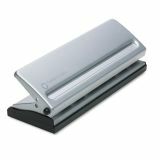 FranklinCovey Four-Sheet Seven-Hole Punch for Classic Style Day Planner Pages, Metal - Metal hole punch is easy to use on your desktop or in your hand so you can easily hole-punch documents you need to keep in your planner. Precision-tooled punch handles up to four sheets at a time, has a spillproof chip collector with trap door and rubber nonslip base. Metal hole punch also features marked guides for your paper and is designed to punch holes for classic-size binders. a spill-proof chip collector with trap door and rubber nonslip base.